This topic contains 31 replies, has 11 voices, and was last updated by John Cockman 4 years ago. A great old time tune with typically sad origins. I really, really would love to get tabs and instruction for playing James Bryans tune, Farewell Trion. here it is for all BGD friends to get inspired. hello, so how goes it now ? Unh Hunr arrrr, after watching the video 13 times or so and cried ! a little you know, I googled it and found the sheet music. Read it 13 times or so just with rhythm only, and noticed it was in C or A min, hum ?. So after playing C scale couple times, how nice of a song, got lost with the bowing. What a groove though hunh !! !…That old subtle bounce like feel. Hope this is ok with abc notation site. Yikes . EDITORS NOTE: THIS VIDEO WAS TAKEN DOWN BY YOUTUBE, PERHAPS BECAUSE OF THE HORRIFYING ENDING. A FIDDLER WAS PLAYING FOR A DANCER ON THE SIDEWALK WHEN ONE OF THE DANCER’S FLAILING ARMS SLAPPED THE FIDDLE FROM HIS HANDS. IT STRUCK THE SIDEWALK WITH A SOUND THAT WOULD SURELY PUT YOU OFF YOUR LUNCH. YOU WILL HAVE TO USE YOUR IMAGINATION. Kevin, that was so painful! Fortunately no real harm done. This was at the “Bear on the Square” festival in Dahlonega for all of you visiting north Georgia this April. It is a fun festival, and one of the earliest of the year. Gu, thank you for posting the video and the music. I am putting this one on my list to teach. I have played it before, it is very beautiful. It is on my list of, “would love John to do a lesson on”. I have the sheet music but just can’t get it close to James Bryan sound. Thanks Bruce. I’ll work on getting this one out! I is high on my list of old-time tune requests, along with “Chinquapin Hunting” and others. Thanks so much for posting this pretty tune! I’ll have to put it on my list of this week’s songs to learn. I’m new here and I am loving the website! 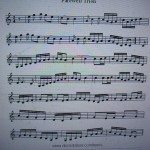 Hi TexasRose, glad you are here, love this one me too, I just got through site reading at 60 bpm, no specific bowing yet, but I am sure John will put up a perfect bowing tab for us all. Trying to memorize the tune without getting too attached to the right way old time feel bowing, but was able to watch the video enough times to see he slides the D down to a C in the opening line, and I am just guessing my best here, from all the lessons here at BGD, I learned from John that shuffle bowing plays a significant role in eight note runs. I ts such a nice song , I cant wait. There is a mystery in the song and a natural suspenseful sustain almost like when fishing on a quiet lake waiting for the bite. I would like to add also, that this song is a great way of learning the C pentatonic scale. Hope I got that right JOhn? In any case it is a beautiful run up and down the fiddle, very Flows with the river song. Gu, that is a great way to describe it — mystery! The more I listen to this one, the more I love it. Arwen tabbed it for me today and I just made some jam tracks for it. I will make a lesson for this song tonight, hope to have it up tomorrow or Thursday. 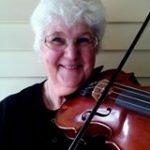 Most of you probably already know this but here is a great site for some of the old favorite tunes (http://www.traditionalmusic.co.uk). A lot of them are in Mandolin tab which is easily converted, unless you are like me, Mandolin to Fiddle tab still makes me go duh. Anyhow I have never seen a reference to this so thought I would mention it for any unaware. Of course this will never replace our Beloved St. John, aka BGD, we will always need his expertise to guide us properly! Gu got the notation above at abcnotation.com. This is another great site. OK fiddlers you can download the official BDG music and MP3s (the best on the web!) 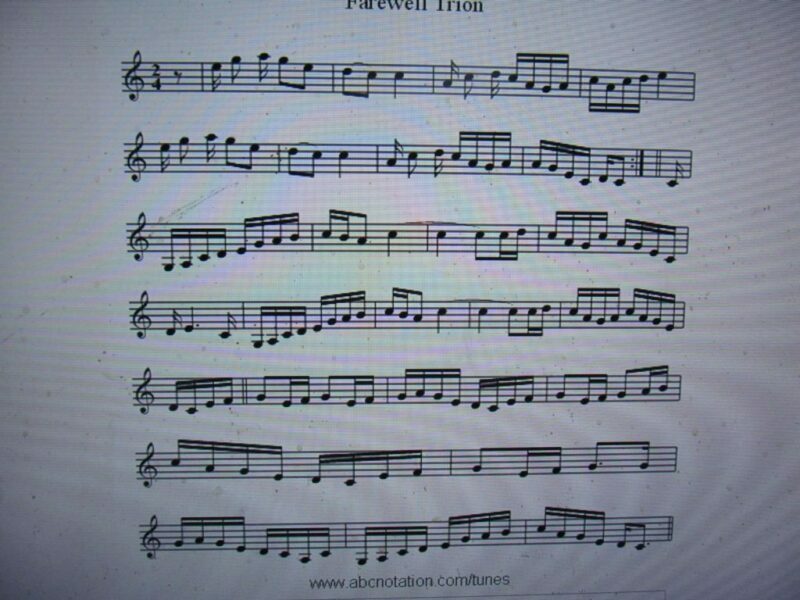 for Farewell Trion by going to the Sheet Music page and the MP3 page. Enjoy! THANKS!!! You are amazing! And thanks again to Arwen for her mad tabbing skills! Wow, thanks so much John and Arwen, I finally got the tune down on my own, well on mandolin, just to memorize , NOW , I get the mp3 and sheet music, I didn’t check for bowing . Just checked , AND THE BOWING YES ! Hi David. Happy New Year! Thanks for posting that link. It is a great resource! You would think a UK site like that would be leaning more towards fiddle tabs than mandolins tabs… but… stranger things have happened in that part of the world! John do you memorize all these new tunes (like this new one) in order to play them? Or do you read a little music while playing, or do you know them already? It seems like a ton of memorization work in only a few days…. Great question Kevin. I memorize all tunes before performing them. It wasn’t so easy at first! However, because I have learned hundreds of tunes, this is very easy for me. It generally takes me listening two times through before I memorize a standard tune. In a jam session, I can typically play the song note for note on the third time around. You all will get faster with each lesson. Sadly enough, you will not need this site after a couple of years, because you will be able to pick up songs at jams or on YouTube easily enough without it. After you graduate from BGDU, I hope you stick around on the forum! When I teach a lesson, I will usually tab it out before even trying to play it (or else pay Arwen to tab it for me — great way to teach her some theory). Then if it is a fast song, I’ll play it a few times through to “settle” on the bowing before adding bow directions to the tabs. Then I’ll practice it a while before teaching it. By the time I teach the measure-by-measure lesson and play it slowly with the metronome, I know it about as well as I ever will. So I practice it a little more with the jam track then make the live performance video as the final touch of the lesson. In “Farewell Trion,” The ‘A’ part of the tune is fairly standard, so it only took twice through to learn it. The ‘B’ part is a little different, so it took me a few more times through and some measure counting to learn it. The ‘C’ part is virtually the same as the ‘B’ part to “The 8th of January” (see the video below) so it only took one time through to learn it. After an answer like that, I marvel at the human brain — taking in notes, chords, rhythms, pattern matching and chunk building at successively higher levels, all in real time. You are also right in that there is nothing new under the sun. As you learn more tunes, the “chunks” get bigger. John, this “couple of years” is a joke, right? I think some of us will be attending BGDU for longer than a couple of years!